Within the last week, Intel released a surprising announcement regarding the capability of its upcoming Skylake-SP processors ahead of any official announcement and release, and the relevance of it extends through to the Skylake-X chips as well. With a multi-core design, how cores communicate can be vital, when sharing data between them or by accessing each other’s cache via snooping or having to go out to main memory. In previous generations, Intel has championed its ring bus strategy. Pretty much every commercial multi-core chip Intel has released uses some form of ring bus, and it boils down to a single communication ring on which all the cores are connected. If data needs to a certain core, it travels on the ring until it reaches the core it needs. The idea is relatively simple, and has worked quite well. It does mean that there is a range of core-to-core latencies however, depending on how far away the core is. Imagine connecting to a network of computers, but you could only connect to the two computers either side of you. If you needed to speak to a computer that was 5 nodes away, the data would have to travel through each of the nodes to get there. Welcome to the ring bus. The speed of this ring bus was typically denoted by the ‘uncore’ frequency. 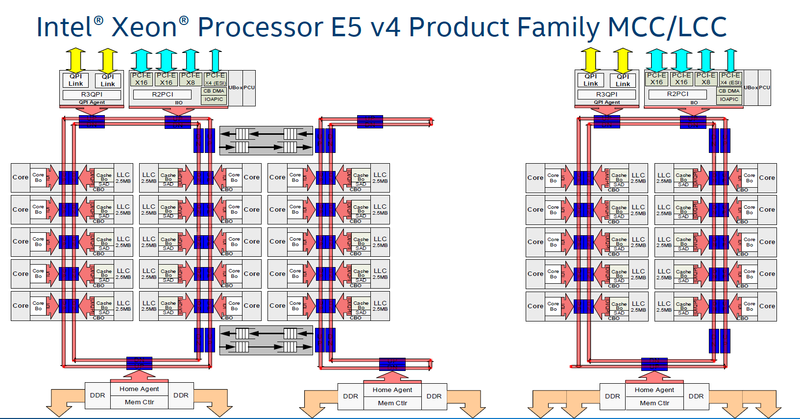 With Intel’s three-die program on its enterprise chips, each one used different variants of the ring bus topology. 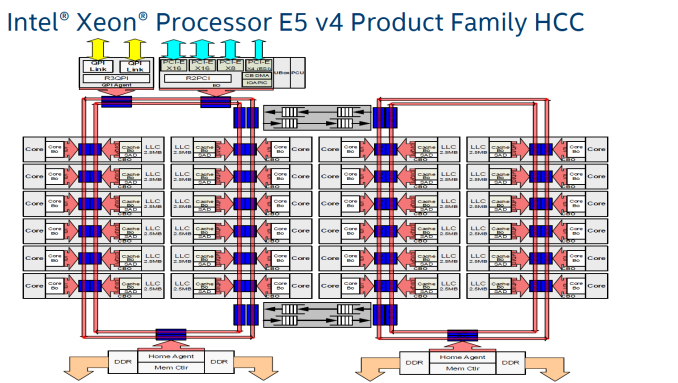 On Broadwell-E, the 10-core LCC design used a single ring bus for all 8 cores and the DRAM controller/PCIe root complex, whereas the HCC and XCC designs both had dual ring buses that used router communication methods to talk between each other. Now obviously talking to a core on the other ring bus added latency, and was sometimes considered a ‘non-uniform memory access’ (NUMA) environment on chip, with extra latency if you needed data from memory on the other ring bus. (Typically NUMA is applied to dual socket platforms, where the DRAM on the other chip has a large delay.) Intel emphasized that the Broadwell-E design was memory location aware, and tried to keep relevant data local to the core it was needed on. With the larger XCC CPUs for Broadwell-E, the ring buses become quite cumbersome: you end up with one ring bus servicing 12 cores, and another ring bus servicing 12 cores (due to the layout with other elements of the chip). As more and more cores get added, what is the solution? More ring buses? How about a 2D array of ring buses? Or even a mesh or a network? The announcement that Intel made in the past week was that Skylake-SP processors will use a mesh topology, whereby each CPU in the design will be connected to the ones above, below, and to the side. Earlier in the week I mentioned on Twitter that a mesh in this context, or as drawn above, is just an array of ring buses in a 2D arrangement, although new information has come to light. Intel already sells chips with mesh connectivity: the latest Xeon Phi Knights Landing many-core processors. These massive (~646mm2) chips have 72 cores arranged as 36 pairs, six memory channels and 16GB of MCDRAM, and using a ring bus (or a succession of ring buses) is probably not feasible. 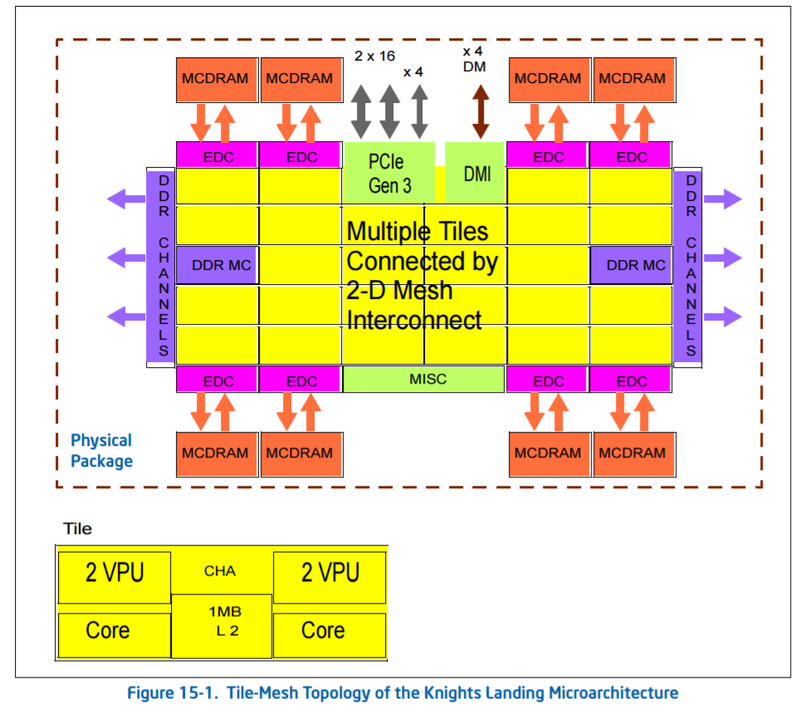 Knights Landing can run in a variety of mesh modes, due to the lack of an L3 but the presence of an intermediary MCDRAM layer, certain modes to do with the memory hierarchy help with different codes. It is not known if Skylake-SP will have the same feature set. 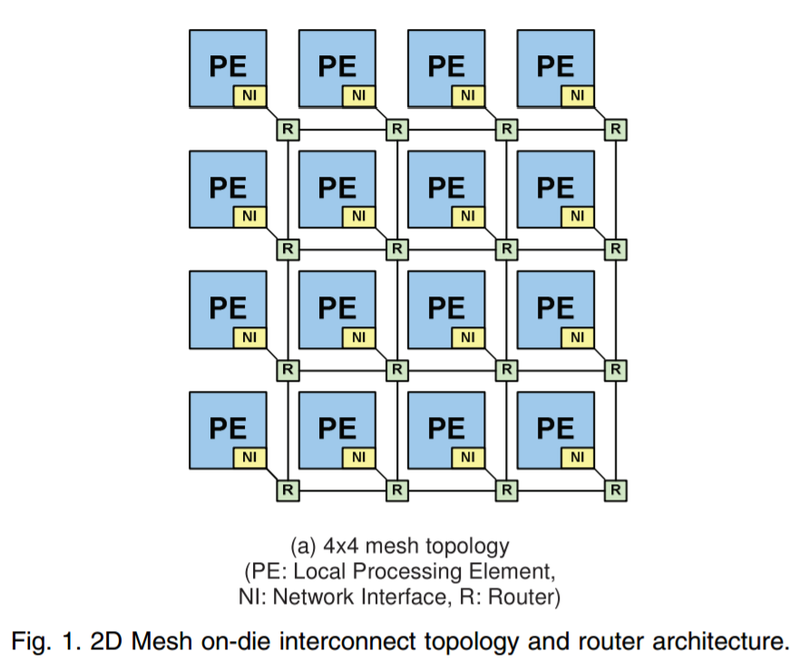 When distributing cores along a mesh, another way to think about it is as a big routing environment. There are two ways – each core could talk to a central processing router which then sends information as it is needed, or each core acts as a networking point itself, forwarding packets in the direction it is needed. The first method, commonly known as a crossbar method, is easier to implement but can be bottlenecked very easily, not to mention power hungry if the whole crossbar needs to be enabled all the time. The second method, where every core is a router node, looks like what we have already in the image Intel provided. The announcement Intel made was done officially by Dr Akhilesh Kumar, one of Skylake-SP’s CPU architects. 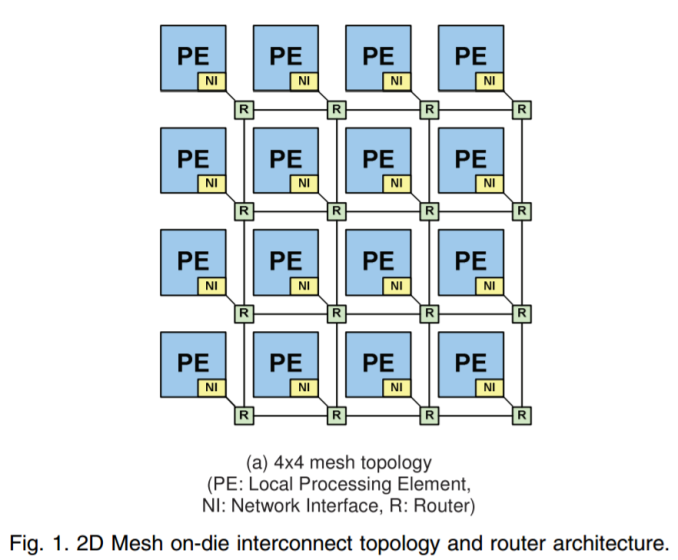 He has been at Intel for a number of years, and digging back through releases with his name on popped up a very interesting paper regarding how to implement a router-like mesh in a multi-core environment, published in March 2014 which is about the right time when Skylake-SPs mesh was being developed. We haven’t had confirmation from Intel that this is how Skylake-SP’s mesh is actually like, though it is worth covering what is in the paper. 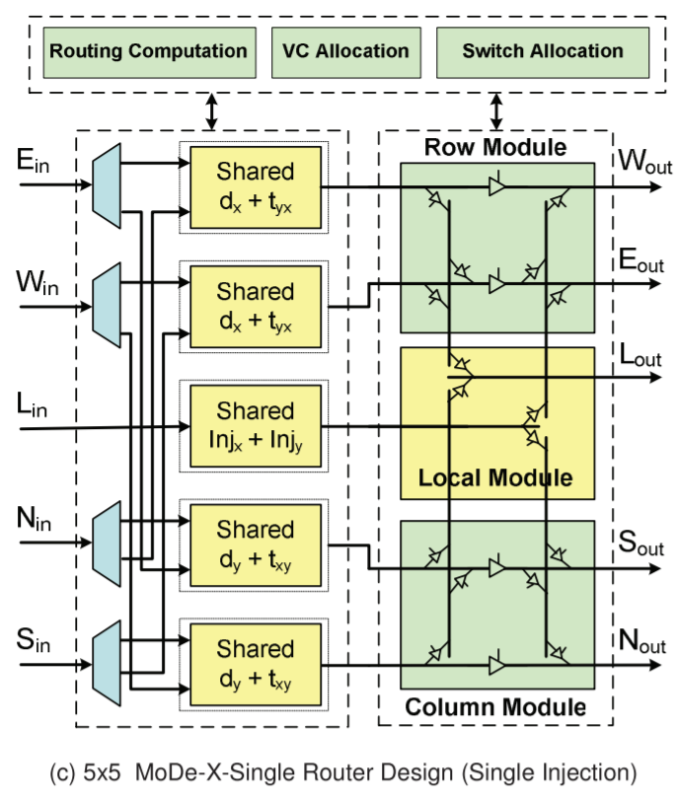 For anyone interested, the paper is called MoDe-X: Microarchitecture of a Layout-Aware Modular Decoupled Crossbar for On-Chip Interconnects, IEEE Transactions on Computers, Vol. 63, No. 3, March 2014 P622. MoDe-X: Is This Skylake-SP’s Mesh? As mentioned above, the easiest way for a mesh/router is through a crossbar. When the design instead uses each core as a node in the mesh, the result is essentially a ‘mini’ decoupled crossbar in each core acting as the director for data coming in and out of the core. With each core in control of its own actions, the design becomes modular. Put these elements together, and you have a MOdular DEcoupled Crossbar, or MoDe-X. Each core has an integrated network interface and a router, with each router connected to the four routers around it (or 2 routers for corners and 3 routers for edges). A data packet can come in one of five directions – north, south, east, west, or from the core the router is attached to. The data packet then needs to be sent to one of five directions again: north, south, east, west, or to the core the router is attached to. If each core is essentially a node on a 2D map with an x-ordinate and a y-ordinate, if a packet needs to go to (0,0), the router can send it on its way as it knows which nodes are nearest to it. There are algorithms designed to reduce congestion, such as only moving in the x-direction until you are correct then start moving in the y-direction, but a basic system will have buffers and queues and will know how busy the local network congestion is. On the left are the five inputs: E, W, L (local), N, S.
The first column of ‘shared’ boxes determines where the data wants to go: does it need to traverse a row, a column, or stay local. From each input, there are only two arrows going to either the top pair or the bottom pair of ‘shared’ boxes. Depending on contention and allocation, the data is then sent to the second column whereby if the data needed to change columns, it could either go to Sout or Nout and if it needed to change rows into Wout or Eout. In both circumstances the data could go to the local node. In the research paper, there is a six-input design which modifies the local input in order to make the wiring in the second half of the design easier (and it lowers power), but the image above is a fair representation of the idea. There are other additions in the paper as well, with layout aware arrangements (how exactly you put it together in silicon) as well as feeder wires such that if data needs to continue in the same direction it can do so with less effort. The paper is very dense (it took me a while to get to grips with it), but worth a read if you are interested. I found it easier to consider it more like a router, than an on-chip mesh. As mentioned, this is a 2014 paper, and shows simulation data on an 8x8 grid of cores, where this design is both lower power and smaller area than a generic mesh design or competing designs. There were some areas where the generic design had marginally better latency, but the power conservation numbers (due to the wiring reduction and an aggressive power gating scheme to disable certain parts for up to 99% less power use) makes it a more attractive option (especially in multi-core CPUs). Intel was doing simulation work in early 2014 (which means 2013), and the paper mentions that they were in the process of putting these ideas into silicon. It wouldn’t be too far-fetched to consider that this is what we are seeing today. With 8 cores and up, thermal is a big issue when you OC Skylake X.. Power also to some extent. The 6 cores looks interesting vs the 7700k but not so much vs anything else. CPU+mobo gets you north of 600$ and that's a lot. If it had all the PCIe lanes enabled, there would be that but ,while plenty will buy it, it makes no sense to. And ofc there should be a Coffee Lake 6 cores soon , we'll see how it is priced- in consumer 6 cores with 2 mem chans is fine. More than 6 cores are priced way too high and , if you need many cores, you buy for MT not ST so ST clocks are less relevant. 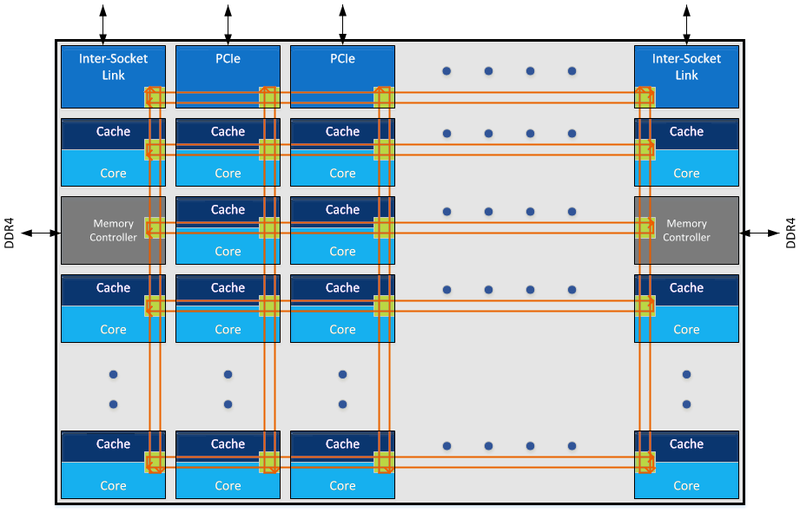 Intel moving in the same direction as AMD on the cache size front is interesting- larger L2 and smaller L3. Now they have "huge cache and memory latency issues"" just like Ryzen lol. Funny thou, when Ryzen under-performed in games that was no reason to not publish gaming benches, in fact being the platform's main weakness there was actually emphasis put on that... but when it comes to intel we gotta have special treatment... Let's hear it for objectivity! Granted the 7800X finally brings something of relatively decent value, but still no good reason to justify the purchase unless one insists on an intel product, for the brand, for thunderbolt or hypetane support. "To play it safe, invest in the Core i9-7900X today." We've always posted manufacturer MSRPs in our CPU charts. There has been no official price drop from AMD; if you're seeing lower, it's being run from the distributor level. Dunno Ian, in my book this sounds more like hasty than safe. The safe thing would be to wait out. Even without the incipient TR launch, early adoption is rather unsafe on its own. As it is, it sounds more like an attempt to dupe people into spending their money on intel in the eve of the launch of a superior value and performance product from a direct (and sole) competitor. It is true that nothing is still officially known about TR, but based on the ryzen marketing strategy and performance we can make safe and accurate speculations. I expect to see the top TR chip launched at 999$ offering at the very least 30% of performance advantage over the 7900X in a similar or slightly higher thermal budget, of course in workloads that can scale nicely up with the core count.